Looking towards the upcoming year, the United States looks to have another economic increase over 2017 with some estimations putting GDP growth to around 4%. And with consumer confidence nearing an all-time high for the millennium, US businesses need to be able to meet this demand and maximize overall gains. For the warehousing industry, this includes boosting the total usable area and decreasing the cost of day to day operations. However, new, quality warehousing space is harder to come by and rent for this space is constantly increasing. So, more and more companies are must make do with their current space with no time to construct a building to fit their needs. There are many different avenues and ways to try to pursue this goal. So, with another strong economic outlook for the coming year, what are some ways that warehouses can upgrade their facilities for 2018? Aside from adding on to the outside of a warehouse space, utilizing the limited space provided will be the best way to get the most out of the area. To start this process, the overall layout of the warehouse must be examined in order to find inefficiencies. Start with the aisle layout. As a general rule of thumb, aisles should be as narrow as the operation allows. However, the aisles will need to be wide enough for the material handling equipment to move through the aisles safely and should never impact operation efficiency. This is a great place to start increasing the storage space of a warehouse. Similarly, to aisle layout, mezzanine storage will allow a warehouse to best utilize its given space. However, mezzanine systems maximize vertical usable space in a warehouse by providing a second floor above the warehouse floor. As opposed to adding an addition to a warehouse, a mezzanine floor takes advantage of the space already provided in the building. In addition, a steel, bolt together mezzanine system can be installed in a fraction of the time that it takes a stick-built alternative to be put in place. This decrease in project time equals less facility disruption and downtime. Also, mezzanine floors can be designed to fit a variety of specific needs that a warehouse may have. 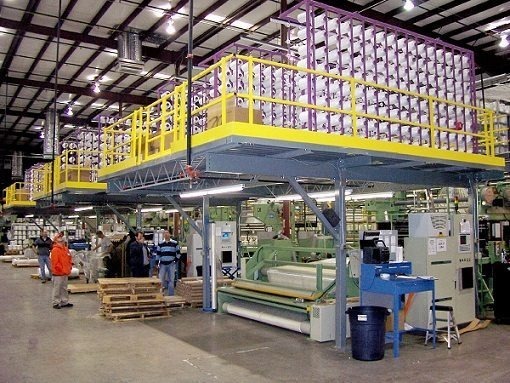 Conveyer platforms, crossovers, and catwalks are all different applications for mezzanine systems that can upgrade a warehouse’s work processes by allowing alternative pathways for products or personnel. Another form of upgrading warehouse space is selecting the correct storage solution for the particular material in question. Many warehouses have switched to what is known as “double deep” storage, meaning two of the same materials are stored side by side one another. One of these materials is open to the aisle while the material behind it cannot be reached without the first being moved. This type of storage will overall increase the storage density of the materials or SKUs in the warehouse but will limit the accessibility in some regards as well. This warehouse upgrade will not help too much with the optimizing the storage area of a warehouse but will go a long way to reducing overall power costs throughout the year and (far) into the future. With the power efficiency and lifetime of LED lights, they produce more lighting than similar watt conventional bulbs, require little to no maintenance over their lifetime, and produce up to 100,000 hours of light. The low upkeep and replacement costs alone allow LEDs to be a safe long-term investment in a warehouse’s lighting. In today’s warehousing industry, inventory accuracy can be incredibly difficult without the utilization of a Warehouse Management system software. With many of today’s WMSs, a manager can fully account for and optimize inventory control in his warehouse through the use of a single app on their phone. Ultimately, these systems can increase the productivity and efficiency of a warehouse while not increasing the labor supply needed to operate it. Additionally, it allows for greater control and accuracy of inventory and allows more precise shipping times. An emphasis on safety is often a hugely overlooked factor in the efficiency of any type of facility. With valuable equipment, materials, and team members keeping a warehouse up and running, ensuring these three things are protected should always be a top priority. Luckily there are a variety of products and services available to make modern-day warehouses as safe as they have ever been. 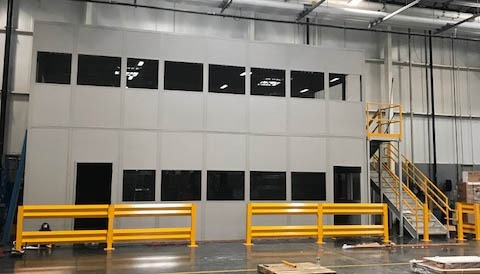 From barrier railing to safety gates, there are nearly limitless ways to increase the safety of personnel, machinery inplant offices, and other equipment. Most warehouses do not have additional space to use for whatever they would like. 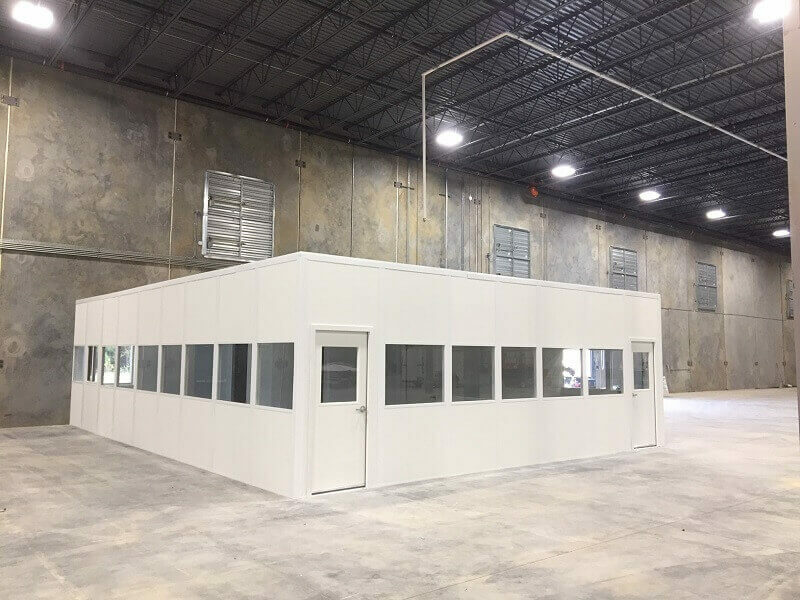 However, like in some of these previous suggestions, utilizing vertical space above the warehouse floor is a great way to provide additional office space to a warehouse with a growing number of employees. Through a combination of a steel mezzanine system and modular inplant office, warehouses with already limited space can provide a comfortable and convenient office space without taking up much of their vital storage area. These modular mezzanine office spaces are typically used in warehouses as supervisor offices, providing a great view of the warehouse floor. However, they are often utilized as break rooms, conference rooms, or even cafeterias as well.